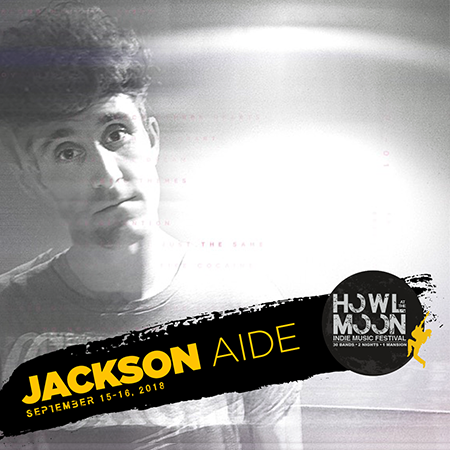 Jackson Aide's influences range from folk-rock to pop-electronic with the angst of a singer-songwriter lyricist that paints a picture of a broken-hearted poet and his notebook that takes a new-age approach to crafting songs that leave the listener with a promontory dreamlike state without drowning them in over-dramatized production. Aides style: a "folk-rock-electronic-pop-art" mused artist with a wink of self-awareness that leans gently against a fashionable nod to pop culture. The debut LP, titled L O V E, defines the relationship between two lovers with the world drifting beneath their feet and the trail of disenchantment that comes with the idea of heartbreak. It mimics Tom Petty's Damn The Torpedoes during the upbeat moments, and rattles and hums a quick distinction to his idol Bob Dylan during acoustic ballads, with come-on sing-along anthemic antics that replicate the energy of a young Bruce Springsteen. Lyrically Aide paints his picture full of themes, colors, and characters which can be experienced visually within the record's artwork. Aide himself does everything in-house. The songwriting, the lyrics, the art-work, the aesthetic, this is an image he crafted for himself. Jackson Aide's craft isn’t just a songwriter, producer, or a poet. Aide himself wants to be an artist in its purest form, the inventive genius. This type of mindset is only for gamblers, but if it runs true, Jackson Aide will be a voice of perspective that evocatively speaks for generations to come.